Want to get the hottest Google searches delivered to your RSS feed reader every hour? Well, Google doesn't make it easy for you to do that since there are no visible RSS subscription buttons anywhere on Google Trends. Contrast this to the Yahoo! Buzz Index, which may have too many subscription offerings. 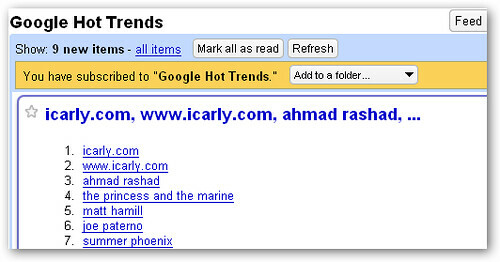 The hidden URL to subscribe to Google Hot Trends is: http://www.google.com/trends/hottrends/atom/hourly. Although, technically, it's an Atom feed (not RSS).